I ended up making 2 cards in the same lilac colours. Which do you like better? Unfortunately we occasionally need Sympathy cards and it is always handy to have some on hand. Here is my entry for this week's card challenge. Pop over to CAS on Sunday to see all the wonderful cards to inspire your next card creation. The second card also fits with the monochromatic theme over on the Paper Players Challenge this week too! Popover there to see more ideas too. I loved having my 3 of my 4 kids here over the weekend along with my daughter in law and 2 young grand daughters however, I am feeling absolutely exhausted. I really must remember I can not do anywhere near what I used to be able to do pre-cancer. Still one must make the most of every opportunity one can even if I have to conk out when they leave and have a few very quiet days afterwards to recoup my energy. I can see a few quiet days doing queit craft work is just what I need to start this week. Have a wonderful week yourselves! You are right, it is better to have sympathy cards on hand. And these are absolutely lovely. Thank you for joining us at The Paper Players. Thank you. It is my first time joining in at The Paper Players! I like that first one -- the water colored flower is very pretty! Thank you. I love Fuchsias and I love watercolouring direct on to a stamp. Love the cards, especially the one with the fuchsia. Thank you for your lovely comment. I am so sorry it has taken me so long to respond. Both are pretty....but I think the first one is my favorite! Thanks for playing with the Paper Players and sharing your creations! Thank you for your lovely comment. I am so sorry it has taken me so long to respond. I am sure you'll forgive when you read why! 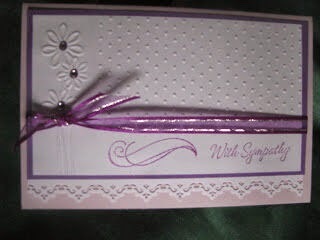 Both lovely cards - the purple against the white adds just enough colour for a sympathy card. Thanks for joining us over at The Paper Players this week.